Here lies the old-world charm of home-baked bread and earthy chai. “Khosh aamadi! Ke khoshaamad maraa ze aamadanat. Hezaar jaan e geraami, fedaa ye aan qadamat” (Welcome! For your presence has affirmed my being. May a thousand beloved hearts be bestowed at your feet), said a friendly old Iranian gent warmly placing his hand on my shoulder as I settled on one of the old tables, staring out at a gentle drizzle. Aflatoon Shokri, 80-something, sparkling white hair and his leitmotif radiant smile welcomed me with a gem from his meticulously preserved repertoire of classical Persian poetry, his quaint, 108-year-old Iranian restaurant in the heart of Mumbai seemed to glorify the words of all his childhood heroes, legendary Iranian poets like Ferdowsi, Saadi, Jami and Rodaki. This second generation torchbearer of Mumbai’s famous Kyani & Co. Iranian restaurant is a man of many stories right from the days of the Raj to Raj Kapoor’s unforgettable visits to place during his heydays. As we unwind over the most irresistible chai (tea), we delve into the enchanting world of eclectic Persian poetry as he nostalgically reminisces about his days in Iran. I remember treating my grandparents at Kyani on their 50th wedding anniversary. It was their favorite haunt in their days of courtship. Sitting on the same table as they did on their very first date, “This is where I proposed to your nani” gushed the romantic septuagenarian as they devoured Kyani’s signature Mawa Cake (muffin), Bun Maska (oven-fresh buttered bread buns) and Khari Biscuit (savory biscuits) like in the old days. These quaint, old Iranian restaurants are an indispensable part of Mumbai’s culture and were established by Iranian immigrants who arrived in the mid and late 1800s. Apart from the Parsis who were Zoroastrians who settled in India after fleeing the Arab invasion several centuries ago, many among the Zoroastrian minority of Islamic Iran immigrated to India around the same time and were called “Iranis” or “Zarthushti Iranis” (Zoroastrian Iranians) and easily mingled with the Parsis as well as the locals. While western brands like McDonalds, Café Coffee Day and KFC storming the market, only a handful of these grand old restaurants survive today. Despite the lure of synthetic goodies and swank chill-out joints, the charm of the city’s “Irani hotel” culture continues to casts it spell on its ardent patrons of all ages. “These restaurants were originally established by the Iranians as a means to earn a livelihood when they arrived in India. Here, one could not only enjoy a hearty snack, but also purchase groceries and other household items. They were mini-supermarkets of their era,” says M.F. Mahabat, an elderly Iranian of the trade and a prominent member of the International Baha’i faith founded in Iran. In Ballard Pier, Mumbai’s commercial hub and the harbour area stands the grand old Britannia & Co. One of the world’s most sought-after Iranian restaurants, Britannia and its mentor, India’s grand-old Iranian and a living legend Boman Rashid Kohinoor have dazzled the likes of Queen Elizabeth with culinary seduction, Persian style. A darling of guests of all ages and communities, 90-year-old Boman is on his feet throughout the day, table hopping and personally attending to guests from varied nationalities. With its old-world décor, fragrance of sandalwood incense and the roar of hardy laughter, Britannia takes you into a world of its own. Though being strictly a lunch place, the restaurant is effervescing with office-goers and expats, each devouring their personal favourite from Britannia’s signature menu. “One of Queen Elizabeth’s representatives, after visiting the restaurant, took home the exhilarating experience and Her Majesty not only sent a letter of appreciation to my father, but also her photograph just about a month ago,” smiles Boman’s son Afshin Kohinoor proudly pointing towards the neatly framed photograph of the queen put up besides an old grandfather clock. Along with the all-time famous Sali Boti, Parsi Mutton Dhansak and Caramel Custard that beats the Crème Brulee of any fine dining restaurant worth its salt, one of Britannia’s most famous delicacies is the Berry Pulao or Polo ye Zereshk in Persian. A traditional Iranian rice preparation consisting of fresh Persian barberries, nuts with either eggs, chicken or vegetarian along with a sizzling masala gravy, the Berry Pulao is pure manna. “Originally in Iran, it was just rice, barberries and a chicken leg, something that was too bland for the Indian palate. My mother Mrs. Bacha Kohinoor later included the masala gravy considering that Indians never eat rice without a gravy,” explains Afshin stating that she was the one who made the transition from continental to Persian cuisine in 1982. The Iranians use barberries for their nutritional value as they play a vital role in cutting the cholesterol, cutting the starch in the rice and to control high blood pressure. The community of Iranian restaurateurs of Mumbai is known for its legendary, well-guarded culinary secrets. “Even the simple chai formula of one restaurant would never be disclosed to another!” smiles M.F. Mahabat. When the current US Ambassador, also an avid chef on a visit to Britannia requested Boman to share his Chicken Berry Pulao recipe, he was bluntly turned down despite two of the former’s close officials standing in testimony. “But when dad bargained for America’s legendary Coca Cola recipe, His Excellency flatly refused, and they called it quits, all in good humour,” laughs Afshin as he sips India’s first aerated drink, Pallonji’s (1865) popularly known as the “Parsi drink”. “My father, late Aqa Rashid Kohinoor established the restaurant in 1923 and ever since, we have had loads of history associated with the place,” smiles Mehrbaan whose charisma has drawn a long list of celebs right from Bollywood biggies to cricket badshahs to the restaurant. During the Second World War, the British occupied the restaurant and used it for military purposes before returning it to the Kohinoor family. After returning from their brief Iranian sojourn after the fall of the Shah in 1979, the place was reopened in 1982, the cuisine transformed into what the Kohinoors call “the best Parsi food in the world”. 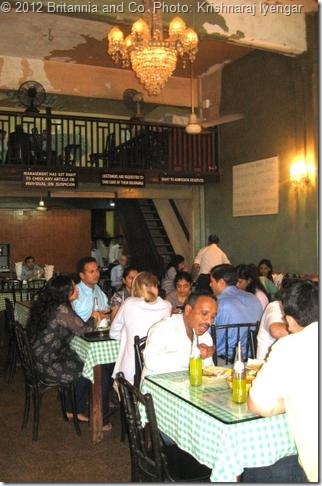 The restaurant was established in one of the first heritage buildings of Ballard Estate in erstwhile “Bombay”. “It is said that the then municipal commissioner, a British ‘Saheb’ promised my father the license within 24 hours (which would otherwise have taken months) if he gave his restaurant a British name. Hence the name Britannia!” he explains, stating that they still use the chairs the founder imported from Poland at Rs. 5 a chair. Besides Britannia’s slogan “There is no love greater than the love of eating” printed on all menus, Robin the rooster is the restaurant’s emblem. Discovered as a newborn chick by Afshin’s late mother on a rainy day in 1984, Robin later grew to be the apple of every guest’s eye. Seated right on the counter, he would crow at dawn, at the stroke of 12 and at dusk, and was the trademark attraction of the restaurant. Among the other old Iranian restaurants of Mumbai still carrying on the legacy are Yazdani Bakery and Sassanian & co. restaurant and boulangerie, while the charming Ideal Railway Restaurant which once stood opposite the railway station of the city’s western suburb of Andheri, has now vanished. Faridoon H. Mahabat, its founder, had arrived in Mumbai with his widowed mother in 1910 and struggled his way up right from doing household jobs at Parsi homes to establishing the best Iranian restaurant in the western suburbs. “My father was called the king of Andheri, but he always maintained that he was just a ghareeb Irani (poor Iranian),” recounts M.F. Mahabat, stating that it was the humility and magnanimity of this Persian restaurateur-philanthropist that won him the love and respect of all, right from coolies and cab drivers to affluent businessmen and celebrities of his time. “I remember how the legendary Vijay Bhatt, pioneer of Hindi cinema, used to spend hours discussing the Baha’i faith with my dad over chai and bun maska at the restaurant,” he fondly reminisces. I still remember my childhood days when Ideal’s manager Rostamji used to prophetically recite Persian poetry to me in his heavy baritone, perched high on the old counter as a long cue of customers would patiently wait for him to finish. Today, with a brand new McDonalds outlet having replaced the cozy 90-year-old restaurant, the words of Persian poet Jami come to mind. “An zamaani ke bar qabram, chaman zanad goli, yaadegaar e man az dowre ye javaani baad” (When the time comes for flowers to become gardens on my grave, be the sweet memory from the days of my youth).